Write a great story with an exciting incident to send the story into action where life as usual changes. The protagonist has clear goals, and the setting puts reader into the story. Use active voice, active verbs, and good grammar. Get to know editors and agents before pitching a story and make sure it fits the category they represent. Follow writing guidelines of editor or agent. Look at website for submission guidelines. Send at least five out at a time from your target list. Be kind, useful, and network. Never bad mouth agents or publishers. Embrace all feedback and don’t let criticism get to you. Move on. Be the easiest person in the world to work with. Have more than one idea; ready for alternatives –what else do you have? This is Freeman’s fourth book in this series about the Civil War and the Union supporting family, the Beechers of Ohio. Freeman manages to weave historical facts with fictional romance seamlessly, making the reader anxious to discover more and more. 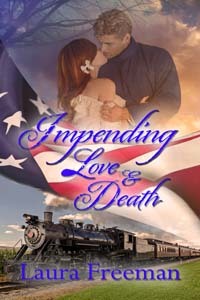 “Impending love and capture” follows beautiful Jessica Beecher, a resourceful 17-year-old, through the horrors of the Civil War. The reader is with the fearless girl as she travels through the devastation caused by the war between the states. The skillful author’s knowledge of the Civil War is astonishing and her telling of the horrors of war brings the reader right into the thick of the carnage. The book details the horrific results of Americans fighting Americans. Jessica, just 17, is plunged into the thick of the aftermath of the fighting, treating injured and maimed soldiers. The author makes the reader take the plunge with Jessica – experiencing the sights, smells and sounds of the war. Jessica’s life becomes incredibly complicated when she is captured by a Confederate officer. Her hatred of war, and all that it entails, is brought front and center when she finds herself falling in love with her captor. That love, throws her life into turmoil and threatens her very existence. Her views on life, love and the hateful war are forever changed as she fights to save the man she finds she cannot live without. Morgan swung her onto the wagon seat and joined her. He moved his haversack as far from her reach as possible.